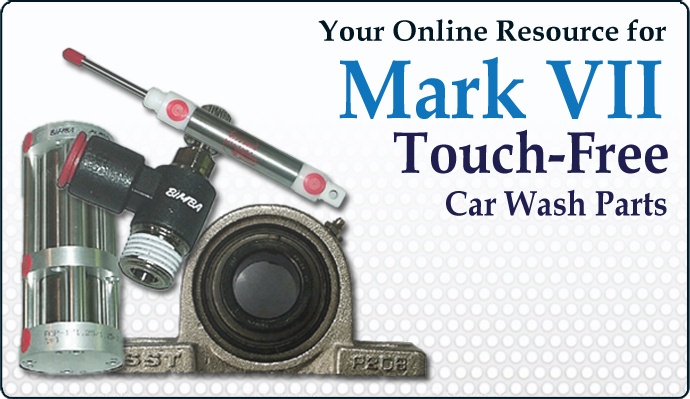 Everything you need to keep your Mark VII® Touch-Free Automatic washing cars and making money! Welcome to Landon's Car Wash, your online resource for parts and expertise for your Mark VII® Touch-Free Automatic car wash equipment. We make it easy for you to get the parts you need, quickly and easily. View and choose the parts you need from our parts page, or call us at 800-467-2690 and let us help you determine the parts you need to repair your Automatic and keep it running and making you money! Whether you're an owner operator or a car wash service company, Landon's Car Wash can help! It’s simple: view our products online and give us a call! As your complete resource for Mark VII® Touch-Free Automatic replacement parts, we deliver quality personal service when you’re ready to place your order. If you’re a car wash operator or service company, you’ll find all the Mark VII® Touch-Free parts you need with the reliable customer service you want. Let Landon’s Car Wash help keep yours or your customers’ businesses up and running. Call us today! We strive for same day shipping on all orders! We have the parts you need to keep your equipment running or to help build your service business! View our parts pages for the new parts you need. Not only do we have hundreds of parts in stock, but we also have the technical expertise and personal service you can rely on for quality assurance. Don’t see the part you’re looking for? Our inventory is always growing, so even though you don’t see it, we might have it. Contact us to place your order! At Landon’s Car Wash, we own and operate a self service car wash and a Mark VII® Touch-Free Automatic car wash along with a neighborhood coin op laundry. For your convenience, all Landon’s services are located in one central location at our facility in Canton, PA.
Click here for Car Wash and Laundry hours or call 1-800-467-2690 for more information. © Landon's Car Wash .Custom Website Design by MilesTechnologies.com.